Whether it is a sweet 16, or a sweet 70 soiree, partyPOP is the ultimate source for all your birthday party needs! If you need birthday invitations, are looking to hire a venue, caterers, flowers or balloons, PartyPop has it all!! After you have picked a theme, look through our website for everything birthday related; photographers, entertainment, decorations and even birthday party favors, and gift bags. 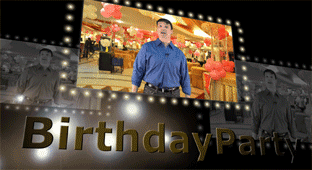 Our birthday themed video has tips to help you plan a celebration for the ages!